State health officials say they are closely watching for the arrival of Swine Flu in Wisconsin. So far, there have been no cases of Swine Flu in Wisconsin. Still, State Health Officer Dr. Seth Foldy says it would not be a surprise if cases were to appear in the near future and the state is planning accordingly. Dr. Foldy says there have been at least 10 suspected cases in the state so far, but tests on each came back negative. Many of those were from people who had recently traveled to Mexico on Spring Break trips. He says people should be tested if they have a connection to an infected area or have been near someone with the flu who has also been in contact with Swine Flu. So far, Foldy says Swine Flu cases have been found in Mexico, Canada, California, New York, Ohio, and Kansas. Department of Health Services Secretary Karen Timberlake says the state has been preparing for a potential flu pandemic for years. She says they already have a stockpile of supplies and anti-viral medications, and are expecting additional help from the federal government to help increase their stockpiles. The state would be able to treat about 10-percent of the population with its expected level of supplies. 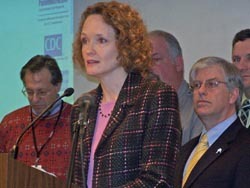 At this time, Foldy says none of the U.S. cases of Swine Flu have been fatal and only one has required hospitalization. However, he says there&apos;s no way to predict if the virus will grow worse as more cases are discovered.